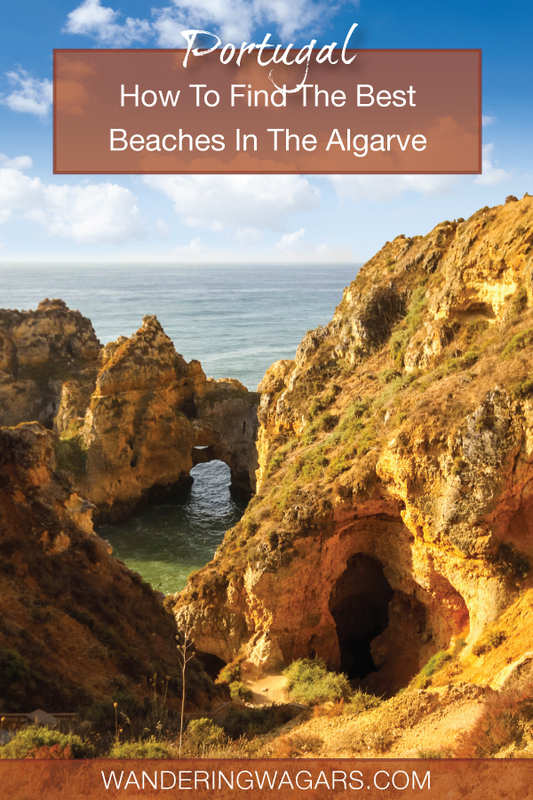 Travel to the Algarve beaches was going to be our chance to see the sunniest side of Portugal. 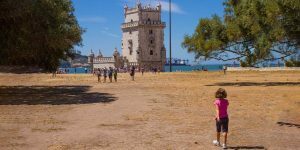 Sure, we had traveled to Lisbon with kids as well as to the stunning places like the castles of Sintra and the amazing Portuguese monasteries, but spending some time as beach bums in one of the world’s best beach regions was something we were all looking forward to during our first family travel experience. This would be our big do, our chance to find out just how difficult it would be to include a child in our travel lifestyle. We were several days into our adventures in Portugal, which was our first big trip five months after having C. We had settled in the city of Cascais as our home base, but after a few days and some exciting adventures we decided to spread our wings and venture south to the beautiful Algarve region for some fun in the sun. Where Are The Algarve Beaches? 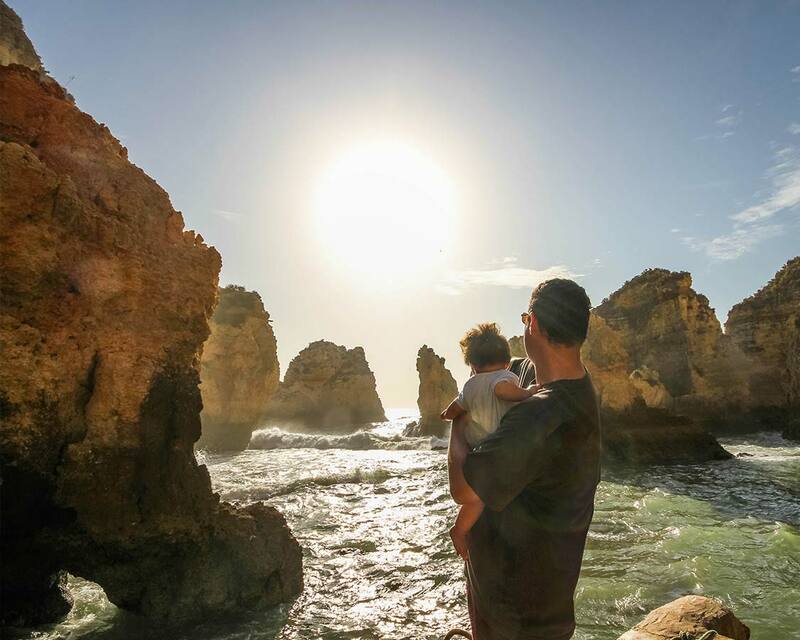 Do We Recommend Visiting The Algarve With Kids? The Algarve region is located on the southern tip of mainland Portugal. The capital of Algarve is the city of Faro, but it contains many of Portugals most popular tourist cities such as Lagos and Albufeira. The Algarve covers nearly 5,000 sq km extending from just south of the Tagus valley to the southern coast of the Iberian Peninsula. The Algarve is known for having mild weather year round with the warmest temperatures occurring during the high season of July and August where the temperature fluctuates between 25°C up to 40°C by mid-day. Getting From Lisbon to Algarve requires an easy 2.5-hour drive. We were traveling from nearby Cascais. The drive from Cascais to Lago was a pleasant 3-hour drive, even with our five-month-old C along for the ride. Traffic was light on the toll highway and speeds were much higher than what we were used to back in Canada. We had never seen a highway with such a variance in traffic speed. The listed speed was a minimum of 40 km/hr and a maximum of 120 km/hr and we saw vehicles doing that entire range and beyond (We hit about 180 at one point, and still got passed like we were standing still). It’s also possible to hop on a plane to take a quick 45-minute flight to Faro followed by a bus or taxi to Lagos which is around 90 km away. 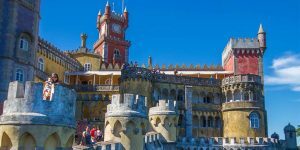 Also available are the trains and buses from Cascais to Lagos. A closer town on the Algarve from Cascais would have been Albufeira, however, we decided to go to Lagos to experience the postcard-perfect beaches with the abundant rock formations, grottos, and caves. Making time to find the best beaches in Algarve is something that every sun lover should make a point of doing in Portugal. 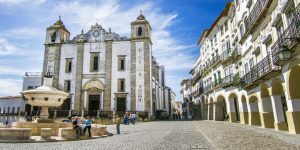 Yes, Portugal is littered with incredible historic destinations from areas where you can walk in the footsteps of dinosaurs, to magical cities like Evora. And if you stick to the southern region of Portugal, it’s easy to experience a lot of these areas in a short time. But experiencing the Algarve beaches is something special, even in the hot summer days when we were visiting. 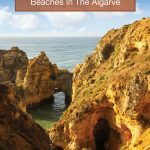 What makes the Algarve beaches some of the best beaches in Portugal is just how many things come together to make the experiences unforgettable. The landscape of the Algarve is beautiful. The coastline is easily compared to other amazing beach locations such as Bermuda and the Philippines. 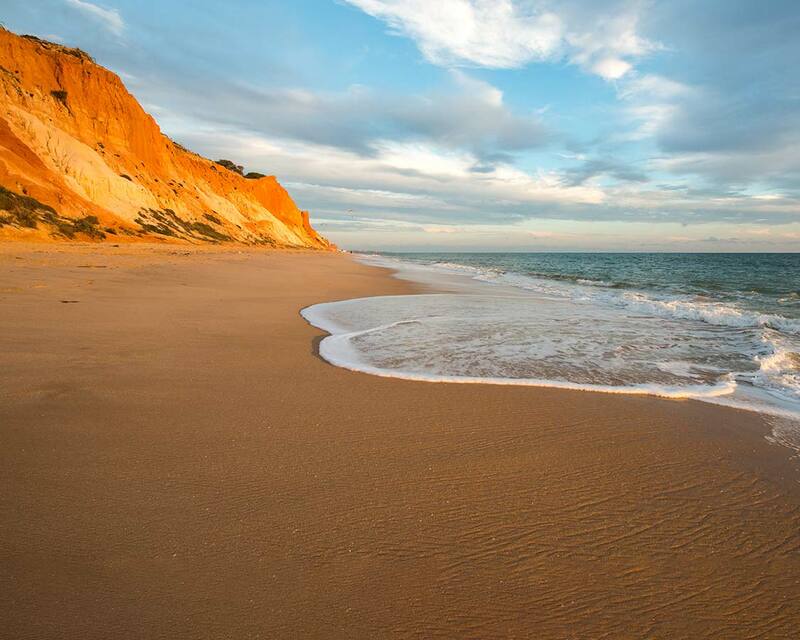 The beach sand in the Algarve is a rich golden color. The climate is Mediterranean, but, if you look, you can find both amazing surf, and calm coves. And with over 150 beaches to choose from, you’ll never be too far from one of the Algarve beaches. Praia Dona Ana or Dona Ana beach, in the city of Lagos, was our first view of an Algarve beach. And let me tell you, it set the bar very high. Dona Ana beach was spellbinding. The rock formations, carved by the Atlantic Ocean washing over the rocks over thousands of years, were magical to behold. 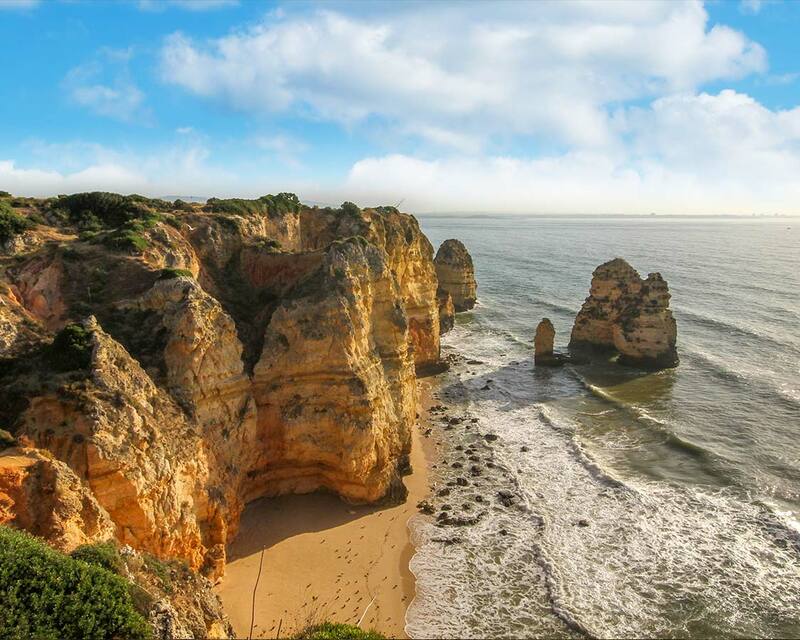 Few places look exactly like you anticipate, but Algarve beach coastline matched the depiction in postcards and Google images to a T. In fact, many people say that the landscape here reminds them of the 12 Apostles along the Great Ocean Road in Australia. Because of the beauty and accessibility of Praia Dona Ana, it can get very busy. It took us some time to navigate the sea of bronzed bodies and find a patch of sand big enough to lay 2 beach blankets. We lucked out by getting a spot tucked into the shade of the nearby cliffs on the right side of the beach. Still, with the summer heat coming off the sand, we had beads of sweat pouring down our backs before long. Kevin went to cool off in the turquoise water of the Atlantic Ocean first while I stayed with C. I helped him dig his tiny little toes into the sand but, at the time, he wasn’t a fan of having dirty feet (Oh how things change in time!). I took him down to the warm waters and, after dipping our toes in the incredibly blue Atlantic waters we retreated to the shade where he was happy to sit and people watch from our beach blankets. By the time Kevin had gotten back, little C had fallen fast asleep. Dona Ana Beach sits in a picture-perfect cove and is sheltered from the wind. This Algarve beach is accessed via a steep set of stairs that lead down from a crowded parking area. Dona Ana Beach was expanded in 2015 with additional sand, and some people have said that it made it a bit less pretty, but, it’s still gorgeous. Praia Dona Ana also offers easy access to nearby Praia Camillo, which offers some facilities, and Prai Pinhao which has no facilities. Both of those beaches are less popular but are no less beautiful. There are countless resorts in Algarve Portugal. 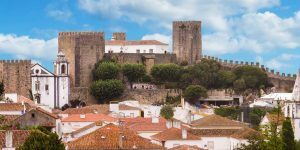 And whether you’re looking for apartment-style accommodations or hotels, families visiting the Algarve with kids will have lots of options to choose from. We opted to stay at the Carvi Beach Hotel which is located a short walk from Dona Ana Beach. The Carvi Beach Hotel has a great location, amazing amenities, including a pool that we didn’t use because we spent all of our time at the beach. It’s also very close to excellent family-friendly restaurants. You can see the rates and availability of the Carvi Beach Hotel on Booking.com here or on Hotels Combined here. There is a small restaurant located on Dona Ana Beach and the cliffs surrounding it are full of excellent cafes. Martins and Lopo is the name of the cafe on Dona Ana Beach. It is known for having excellent food but can get very busy. Another one of the best beaches in the Algarve is Praia da Marinha, which is also located 8 km southeast of Lagoa between the towns of Carvoeiro and Alporchinhos. 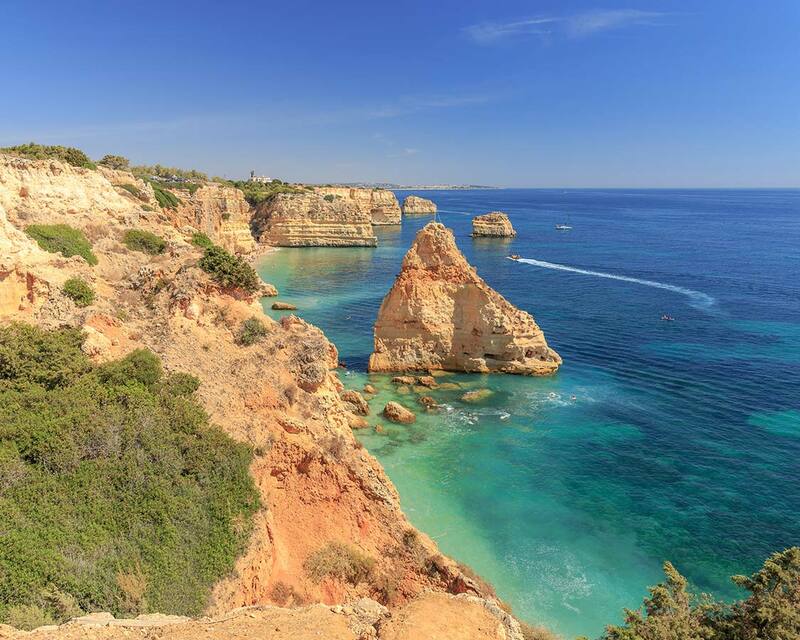 Praia da Marinha is a favorite among locals for the gorgeous limestone rock that shoots up like columns from the sea. Praia da Marinha may have even more dramatic scenery than Dona Ana Beach, but it’s more remote location makes it less appealing to many beach bums looking for quick access to sand and surf. One of the most popular attractions of Praia da Marinha is the 5.6 km clifftop walk from Praia Vale Centeanes. This easy, but beautiful stroll is especially popular in the late afternoon when the setting sun lights up the cliffside. This Algarve beach can only be reached via a steep wooden staircase, so it’s not accessible for strollers. There is a parking lot at the top, however, it can fill up quite fast. One of the most exciting things to visit near Praia da Marinha is the Instgrammable Benagil Cave. While much of the coast along the Algarve is dotted with dramatic rock faces and caves, Benagil Cave, which is actually more of a grotto than a cave, stands out for its glorious skylight. Although Praia da Marinha has no amenities on the beach, there are some restaurants and cafe’s very close to the parking lot. Although there aren’t many hotels or apartment rentals near Praia da Marinha, if you don’t mind traveling about 1-2 km, there are some excellent choices. If you are staying for a couple of days, Apartamento Neptuno near Benagil Beach offers excellent amenities including kitchens and pools. You can find their rates and availability on Booking.com here and on Hotels Combined here. One of the most popular restaurants near Praia da Marinha is O Algar. Their airy patio and seafood specialties make it a good choice for families and couples alike. O Algar is just a short walk inland from the beach. If you’re looking for lots of space on your Algarve beach adventure, head over to Praia da Falésia in Albufeira. Compared to Praia da Marinha and Praia Dona Ana, Praia da Falesia is massive. It’s a whopping 3km long and is surrounded by gorgeous white and golden orange walls. And, while the area near the parking lot can get very busy, if you venture towards the ends of the beach it’s easy to find your own patch of sand. One of the things that make Praia da Falesia stand out among other beaches in the Algarve is that it has remained relatively undisturbed by the tourism industry. Because of this it still retains much of the authentic Portuguese charm that more remote regions of Portugal share. There are wonderful hotels and resorts in the Algarve near Albufeira, but one treat is Casa 19. This quaint house, not far from Praia da Falesia has free wifi and a view to die for. This apartment-style accommodation is also one of the best budget deals in the Algarve. You can find the prices and availability for Casa 19 on Booking.com here and on Hotels Combined here. There are many great restaurants near Falesia, but it’s also a wonderful place to keep things casual. Head on over to Pizzeria Falesia. Enjoy one of their oven-baked pizzas and stay for the oversized tiramisu for dessert. 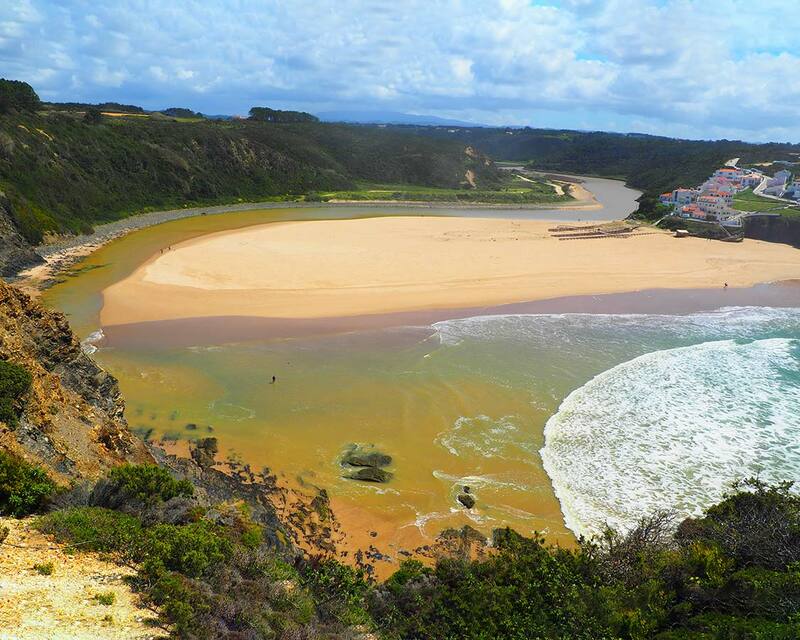 Tucked within Parque Natural do Sudoeste Alentejano e Costa Vicentina is one of the best beaches in the Algarve. Praia de Odeceixe sits at the mouth of the relaxing Ribeira de Seixe. The surf at Praia de Odeceixe can get wild and big, making it a fun spot for older children to jump in the waves. Smaller children will love splashing and swimming in the calm waters of the river. Make sure to explore the town of Odeceixe nearby. You can make the quick drive or take a half-hour walk through the country. The sleepy air of Odeceixe is a perfect contrast to the active life of Praia de Odeceixe. This fun beach is one of the best surf spots in the Algarve. It’s hard to go wrong if you’re looking for great accommodations in Odeceixe. The town is picturesque and very quaint. Many of the accommodations here are family-friendly homes and apartment style rentals. Quinta das Aguas fits that bill perfectly. This quiet, garden home has an on-site masseuse available and offers free bicycles for those staying there. You can find the rates and availability of Quinta das Aguas on Booking.com here or on Hotels Combined here. Odeceixe has some excellent local Portuguese fare. One of the top restaurants there is Altinho Bistro. They serve traditional tapas that are excellent to share for the whole family. We woke up on our first morning on the Algarve beaches and rose with the sun (traveling with a 5-month-old didn’t really give us a choice) and headed towards the shoreline to walk to the famed Ponta da Piedade. The early morning stroll, with the sun shining brightly against the rolling waves, was breath-taking. The beach was deserted in the early morning and was free of the previous days’ noise pollution. I truly felt like we had walked into heaven. The Algarve coastline is 155 km long of glorious landscape and turquoise water. The Ponta da Piedade is a promontory just 3 km west of the town of Lagos. 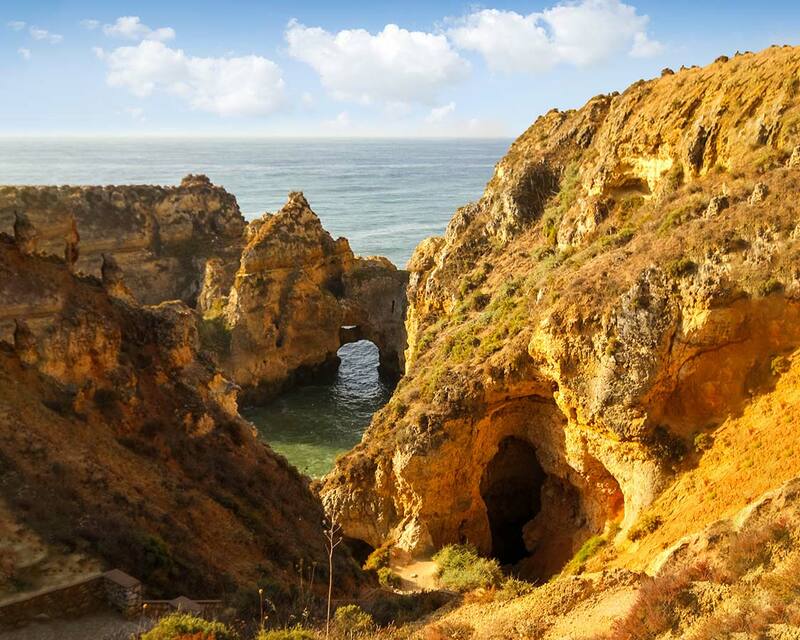 Ponta da Piedade viewpoint there is a cluster of caves, grottoes, and sea arches that nature has sculpted from the cliffs over thousands of years into incredible artwork. We left the stroller at the base and climbed the 182 narrow steps down to the small cove for a better view of the grottoes. There was evidence of the healthy bird population everywhere, some of that evidence dropping right out of the sky. The waters were rough on the morning of our visit though and we couldn’t see any sign of boats for hire. So, we enjoyed the view on our own and took turns naming the various rock formations. It was noon when finished the drive from Lisbon to Lagos to check-in at the Carvi Beach Hotel. From the parking lot of the hotel, we could see that the crowds had already gathered at nearby Dona Ana Beach so we opted to look for a place to eat lunch first before taking a dip in the Atlantic ocean. With the sun beating down us, we quickly re-applied more sunscreen (coconut oil for C) and took C via stroller to explore the town of Lagos. We stopped at a small eatery to have churrasco chicken with potatoes deliciously paired with some vinho verde, a very refreshing young wine popular in southern Portugal. With our bellies full we changed into our swimsuits and made our way to Dona Ana Beach. 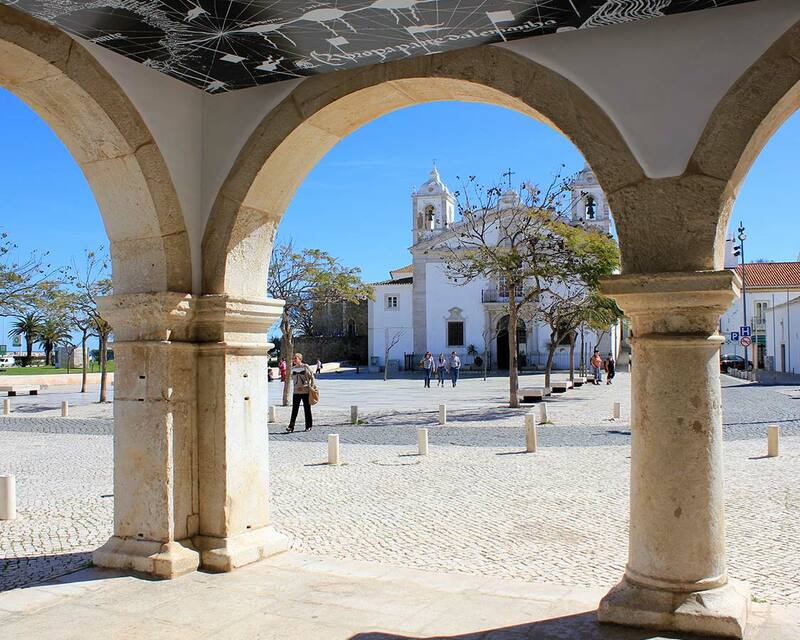 While much of the thrill of Lagos is the incredible Algarve beaches that surround it, Lagos also has an incredible historic center. Giving yourself a few hours away from the waves to explore this pretty city is definitely worth your time. Nearby to our spot on Dona Ana beach, Kevin noticed a short cliff face that looked perfect for climbing. Kevin is never one to turn down an opportunity to explore. So, off he went, up and over the rock face and as usual I sat back and prayed that he didn’t end up breaking his leg. He didn’t break his leg, but he did come back sweaty and excited about what he found. He described finding a cave on the other side of the wall that was paired with a small beach and cove that was utterly deserted of people. 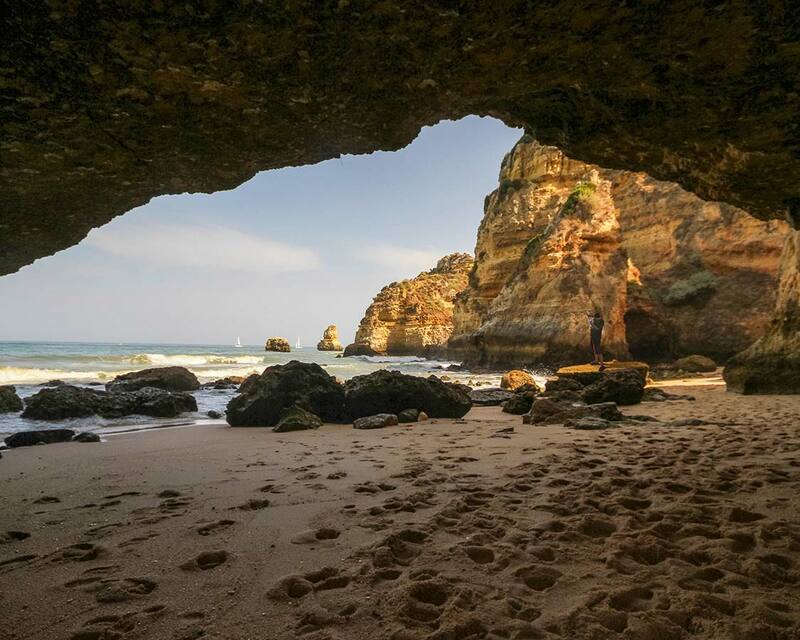 While most of the Algarve beaches can get crowded, especially during the high-season, there are countless hidden beaches in the Algarve that those with a willingness to explore can have all to themselves. 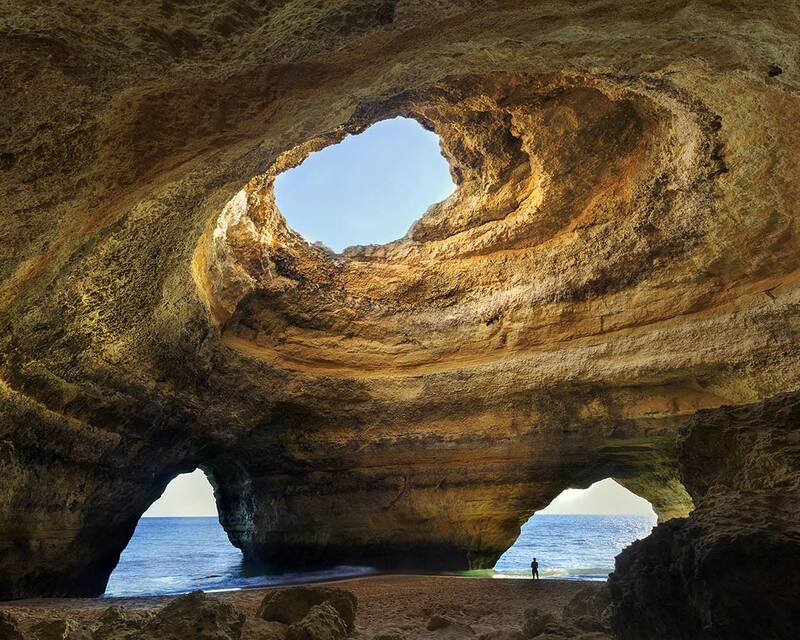 There are also very popular and accessible grottoes in the Algarve such as Cave of the Combs and Benagil cave are popular spots for photographers and explorers alike. We were so happy that we took the time to visit the Algarve beaches on our visit to incredible Portugal. 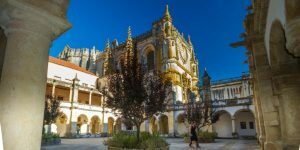 The whole country of Portugal is spectacular, and it has remained as one of our favorite family travel destinations. The entire country is filled with amazing people, but the Algarve beaches will forever stick in our minds as a favorite. Have you been to the Algarve with kids? Tell us about your experiences in the comments. Or, swing by our Facebook page and share a photo of your trip. We would love to share in your journey. The Algarve region looks amazing! Thank you for the beautiful post. Algarve looks tempting, I hope one day I can visit it too. How did you like the Portugese wine in general? Thanks Dominique! Definitely worth a visit if you are in Europe some day. Wow it looks beautiful there! Great pictures! Can’t wait to discover some of the beaches of the Algarve – and the wines, too. So beautiful! My aunt used to live in Lajes, off of the coast of Portugal, and I’m still really bummed that I didn’t get to visit her there. Thanks Sofia! It’s definitely a challenge sometimes but so worth it! Looks incredible, I definitely need to visit some day soon. Very informative post and beautiful photos too! Loved reading this 🙂 I often wonder if I will be able to continue my adventurous lifestyle when I have kids, but you are proof that it is possible! The place is definitely worth a visit. Just added it in my list! Great pictures! I was there a couple of years ago and love it! Awesome place! Pretty sweet that you are able to do all of that with your son as well! He won’t remember it, but the pictures of him traveling the world from such a young age will be amazing! I am super intrigued by Portugal and definitely intend on exploring it one of these days. Thanks Cassie! Traveling with a little one can be challenging for sure. But since I was going to have very little sleep the first year anyway, it was made much better by waking up in the Algarve. Those caves and rock formation look really fascinating. I got a job offer in Portugal but I don’t know if it will push through. Nevertheless, I’m still going to visit the country and jot down this place in my list. So beautiful!!! I want to go! Wow this looks so beautiful! What a dream! The caves and rock formations look super cool too! Caves, cliffs and wonderful beaches, little wonder you loved it so much. I also agree that those multiple speed limit roads are a real pain, especially when you try to stick to the speed limit but everyone else tries to break it! I haven’t been to algarve but with these stunning beach photos, its definitely added to my list. Love the photos of the beach and of Lagos. It’s great that you travel with your five-year-old, travel is the best gift you can give him and I like to think it’s never too early to start traveling with your child. Such a genius post. I love finding secret little spots like the ones you mentioned. Finding them makes such a great adventure! What gorgeous photos. We did not head south the first time we went to Portugal. It was winter so it was far from beach weather, but I guess I’ll have to go back. The place looks awesome! I always wanted to visit Portugal, you gave me an idea! Algarve is beautiful and one of the treasures of Portugal, we have planning to visit Portugal for some time now, hope to get there soon. Lovely post and great pictures. I met a Portuguese guy when I was traveling in Cambodia and he told me about some beautiful places to visit in his home country. Then I planned of going a couple of months ago but did not proceed since I had to prioritize other places in Asia. Now looking at the photos here made me regret of having changed my mind. 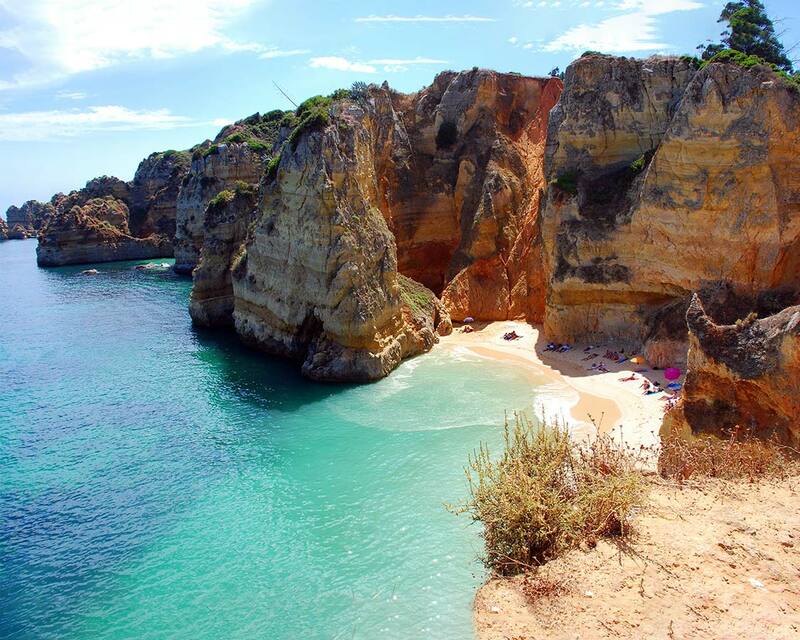 Hopefully I can still visit Portugal and see these amazingly beautiful coves in person. Thanks for sharing. My first question is, what month did you visit? I was wondering about the weather and the crowds. I was wondering if you drove the whole way straight or did you stop anywhere? We will be driving from Evora to Lagos and I was wondering if we should take the highway or are there nice places on the way that we can stop and stretch the drive a bit longer. I love reading you blogs and the pictures are wonderful! We were in Portugal during August. The weather was fantastic although it got cold at night in Sintra and the beach was quite hot in the Algarve. We stopped in as many places as we could during our drive. But we were short on time for our visit to the Algarve, so we took the highway almost straight through. The toll highway is a godsend for avoiding the heavy Portuguese traffic, but it does make it difficult for inspired impromptu stops along the way. Along the coast is Parque Natural do Sudoeste Alentejano e Costa which has many beautiful beaches and places to explore. Not that I need any help getting excited for our trip to the Algarve this Fall, but this certainly has gotten the juices flowing. It’s the last region of Portugal we haven’t visited making the expression “best for last” appropriate. Thanks for this post! This will be very helpful when I start my plan to visit Portugal!